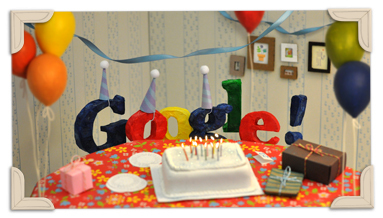 Google is celebrating its 13th birthday today! This is my post about Google’s 8th Birthday in 2006. 1. That everyone starts small and that it takes time to get big. 2. That you accept failures and move on (Buzz, Health etc.). 3. If it is something really important then you try and try until you succeed. (Google’s attempt at social and Google Plus). Here is to another decade of success for Google and You. Next post (New) Facebook is coming your way.